You love to entertain but your dining room is too small. Alex Custom Homes can change that room from tiny to terrific. Look at our website, alexcustomhomes.com, to view examples of their large, airy dining spaces. Are your bathrooms dated and dingy? Alex Custom Homes Remodeling can change them. Explore our website - alexcustomhomes.com and see our many examples of modern, elegant bathrooms. Outdoor entertaining isn't just for Summer. An Alex Custom Home outdoor living space addition complete with a fire pit or a fire place would make a warm and elegant year around party area. As the holidays approach, look at your kitchen. If it is dated and cramped, see how a renovated kitchen by Alex Custom Homes would be a space enjoyed by family and friends alike. As the weather turns chilly, a renovated lower level will give your family a warm and fun living space while adding value to your home. Do you dream about changing your yard into an outdoor living space? Alex Custom Homes' remodeling services will make that dream come true. Change your unfinished basement to a family room that fits your lifestyle. Alex Custom Homes' remodelers will help you create an area that your family will love. Every home remodeled by Alex Custom Homes, LLC embraces the family individuality, and the design elements that make it a one-of-a-kind. 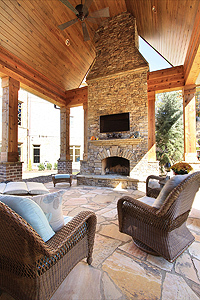 Exterior remodeling can add extra living area and value to your home. INSPECTING YOUR HOME, IT IS WORTH IT? How will a home inspection benefit me? The purchase of a home is the single most costly investment most people make, and you want to know what you are getting for your hard earned money. Inspections are a great way for home buyers to assure themselves that the home they are buying is in good condition. A real estate agent will not determine the condition of the property. It is your responsibility, as a buyer, to ascertain the condition of the property. A licensed, professional inspector is best qualified to make an unbiased and objective evaluation of the functionality of each item or if it is in need of repair. The seller is not required to repair any items, but in the event he/she chooses not to, then the buyer may terminate. to discuss how to remodel your kitchen to make it both beautiful and functional. Alex Custom Homes Are Elegant As Well As Earth Friendly and Cost Effective. See How. The inspiring French Country house plan of this ageless design showcases a spacious two-story grand room and veranda. Included on the first floor is the master bedroom with a sitting area to the rear. A keeping room flanks off of the kitchen and the breakfast area. A front covered porch and a two-story covered rear porch are ideal for outdoor entertaining. An impressive staircase leads you to the second floor which comprises of three additional bedrooms, one complete with a sitting room. An available bonus room rounds out the upper level of this French Country home plan. Above Ground Square Footage: 4,353 Sq. Ft. Basement Square Footage: 3,215 Sq. Ft.
Stone, shingle, and brick mix beautifully to compliment the exterior of this two-story traditional house plan. The covered front porch invites you into this luxury home plan. The large master suite includes over sized walk-in closets for him and her and a sitting room with fireplace. The two-story grand room boasts ceiling to floor windows to optimize spectacular outdoor views. The dramatic angled family room opens to the kitchen and breakfast room and serves as a natural hub and heart of the home for all to enjoy. Upstairs you will find three suites and a cozy reading loft. Above Ground Square Footage: 3,886 Sq. Ft. Basement Square Footage: 2,729 Sq. Ft.